While we're on the subject of pretzels, why not try your hand at making some of the larger variety? This method is surprisingly easy, and it's a great recipe to get any bakers-in-training you have in your house involved in the kitchen. 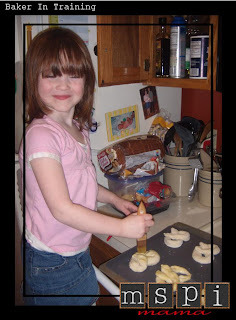 Libby loved shaping the pretzels and "painting" the egg wash on the dough. What a great way to spend a snow day -- our fifth of the year. Friday will be No. 6. The recipe I used comes from The Sisters' Cafe. (I've expanded on the directions to make them a little more user-friendly.) The recipe is especially easy if you have a mixer with a dough hook, otherwise you can still make them by hand. Just roll up your sleeves, coat your counter top with plenty of flour and knead to your heart's content! These are great just as they are or try dipping them in honey mustard. Yum! Add sugar to warm water then sprinkle yeast on top. Let float for a minute then stir to dissolve the yeast. Let sit for 10 minutes as yeast activates and starts to foam. Add salt and flour and knead 5-10 minutes (in a mixer on low or by hand) adding more flour as needed to reduce stickiness. Make an egg wash with the egg and water, lightly beaten together. 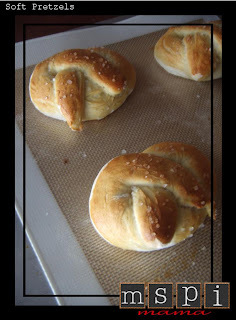 Brush pretzels with egg wash then sprinkle liberally with Kosher salt. Bake at 425 degrees for 15 minutes or until golden brown. Tip: Be sure to liberally coat all exposed areas of the pretzels with the egg wash. It's what gives the pretzels their wonderful color. These look great! My youngest has MSPI and I am looking for snacky type things for him. These would be perfect! I have my MSPI Friendly blueberry muffin recipe posted on my blog. Rachel: Thanks for including my blog on your blogroll! The blueberry muffin recipe looks super yummy. I've bookmarked it and hope to make it soon! Do you really not have to let the dough rise? Yes! What's the point of using yeast, if you aren't going to let it do its job? These turned out great! I made the dough in my bread maker and then made pretzel dogs w it too. We loved them. Thank you for the recipe!